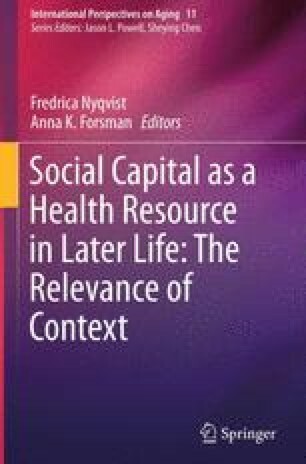 The main interest in this chapter concerns the associations between social capital and self-rated health in different living environments (urban, suburban and rural) among ageing people aged 65–84 years. Two social capital components used were a cognitive dimension (trust) and a structural dimension (social participation and voluntary work). The results are based on data from the nationwide survey from Finland (The Health Behaviour and Health among the Finnish Elderly) and the fourth wave of the European Social Survey. The findings show that high trust indicated better self-rated health in Finland, particularly among rural residents. High social participation indicated better self-rated health in all three areas. Without area selection, high social participation and high trust was associated with good self-rated health. Area differences were not found in self-rated health. Among older Europeans, voluntary work and high trust indicated better self-rated health consistently, regardless of the living area. As a whole, those living in urban areas were less healthy, suggesting health challenges related to urban contexts. Enhancing trust, but also voluntary work particularly among the urban Europeans may significantly contribute to social capital and may have health promotion effects. Thus, investing in a trustful environment and influencing social participation can play a significant part in health promotion. Ehlers, A., Naegele, G., & Reichert, M. (2011). Volunteering by older people in the EU. European Foundation for the Improvement of Living and Working Conditions. Luxembourg: Publications Office of the European Union. http://www.eurofound.europa.eu/publications/htmlfiles/ef1134.htm. Accessed 10 Oct 2013. European Commission. (2013). Eurostat. Country Profiles. http://epp.eurostat.ec.europa.eu/portal/page/portal/user_interfaces/introduction/country_profiles. Accessed 18 Sept 2013. European Social Survey. (2012). http://www.europeansocialsurvey.org. Accessed 12 Nov 2013. European Union. (2009). How to promote ageing well in Europe: Instruments and tools available to local and regional actors. http://ec.europa.eu/health/mental_health/docs/age-cor.pdf. Accessed 29 Aug 2013. Prime Minister’s office in Finland. (2009). Ikääntymisraportti [Report of ageing (in Finnish)]. Valtioneuvoston kanslian julkaisusarja (Prime Minister’s Office Publications) 1/2009. Helsinki: Yliopistopaino. http://vnk.fi/julkaisukansio/2009/j01-ikaantymisraportti-j04-ageing-report/pdf/fi.pdf. Accessed 29 Aug 2013. Statistics Finland. (2013). Income differentials in Finland still smaller than the European average. http://www.stat.fi/til/tjt/2011/05/tjt_2011_05_2013-05-22_tie_001_en.html. Accessed 29 Aug 2013.